Monique Griffith Designs: Let the Week of Giveaways Begin!!!! Plus new "Party On" kit!! Oh another beautiful work of art! Thank you for inspiring me to new levels! what a great way to start the week, I am loving your new work. Keep the inspiration coming, you gals rock! This new kit is beautiful. Great job! The new kit is great. I would love to win Birthday Bash. Your art work is awesome. Your layouts/kits are just wonderful - so detailed. I'm happy you're posting at Everyday Cricut this week as well. Awesome and fantastic LO, as always! I LOVE your kits, as you know. Emily is getting so grown up! Would be very happy to be a winner-- Birthday Bash is at the top of my wish list. Wow - what a detailed LO! IT's so cool - great job! Love all of your layouts and looking forward to your posts on Everyday Cricut. Good Luck this week!!! Awesome layout! I love your creations! Your kits are beautiful!!! Thank you for all the inspiration, so glad I'm a follower! 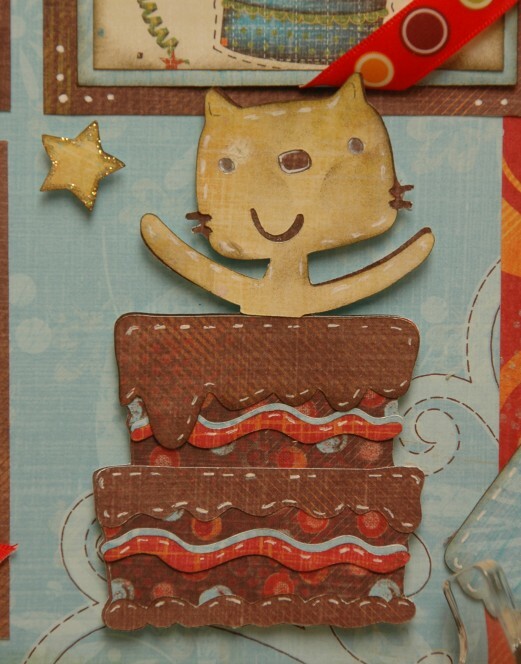 My fav is the kitty on the cake. Great job. Love your layout. Great idea. Such beautiful work! I just love your layouts. Keep inspiring me so I may reach a new level of scrapbooking! Love the little dog with the balloons, so cute! Great layout! Good luck on everyday cricut! Love the new kit! Would love to win Birthday Bash! Thank you. Wow! This is beautiful & fun. And I love the papers, too! 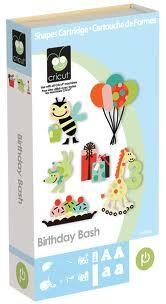 Would LOVE to own the Birthday Bash cartridge as I'm new to owning a Cricut & cartridges! How exciting that you are guest designer all week! Can't wait to see what you bring daily. 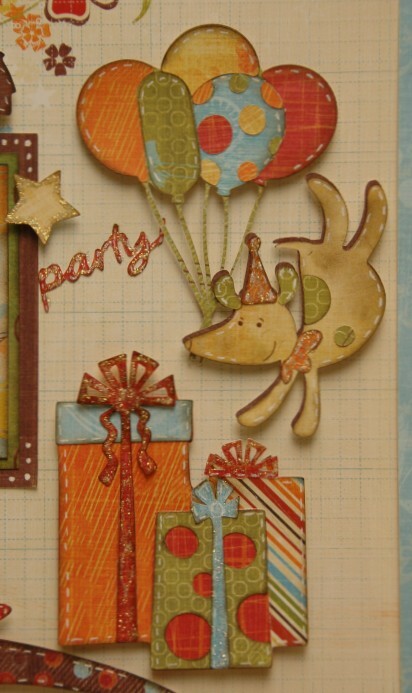 Love all the fun goodies on the Party On page. I love both these layouts! The birthday animals are so cute. And thanks for the info about making your own layers for the bicycle included on EDC. I plan to take advantage of this new found knowledge! Oh my. Two more beautiful layouts. How do you two do it. I love how you can use cuts from several different carts and make them all work so well together! Wow I just got a cricket expression but still can't do this this is amazing!!!!!!!! Congratulations on reaching 2000 :D. Great layouts, and thanks for the chance to win Birthday Bash, it's been on my wishlist for ages! I'm new to Cricut (and after 2 weeks am already in the process of upgrading from the Create to the Expression!) and LOVE your concept! To have clear directions on how/ what to cut to make the fabulous designs I see is very helpful! I love your work and I am so looking forward to seeing all the great projects you will be posting this week. 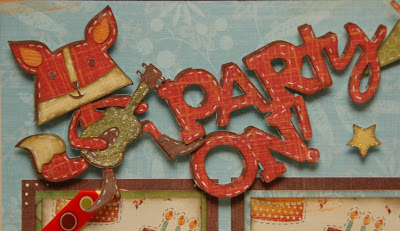 How cute is the Party ON layout! You guys are gonna have fun this week! You just amaze me! These are absolutely beautiful and I can't imagine the time it took to create them! Thanks for sharing! I'm new to your site and blown away by how beautiful your work is!! Excited about following you! 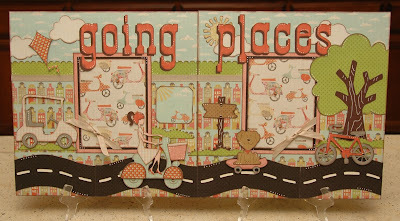 I really love the going places layout with all the cute details. The Party on layout is great I may have to get that one. What great papercrafting and a wonderful kit!I'm glad to see you posting here this week too. I love your designs! Thank you for sharing! So glad to have found you thru Everyday Cricut. Your work is awesome. LOVE LOVE Both of these Layouts!!! You are such an inspiration to me, thank you for sharing your works of art with us! What a great layout. Love all the different pattern papers. Oh my goodness . . . how beautiful! I just love the layout. Thanks for the chance to win the Birthday Bash cartridge. This LO is fabulous! I love all the details that go into the kits, wow! Thank you so much! And congrats on the followers, I'm one too! woo hoo! It's great to see you taking over Everyday Cricut, I love to see your wonderful work! Love the kit and the cartridge. WOW! So much going on this week! I loved the layout at Everyday Cricut this morning and Party On rocks!! Wow......so many new and wonderful ideas, where do I begin???? Hi, Monique, from Maritime Canada. What a darling page but wouldn't expect any less from you. Look forward to the rest of the week. Love the Birthday Bash cartridge. have been trying to get it on eBay but so far have been outbid each time. Oh,well, if at first---try again. I thought the going places LO was amazing but you just get better and better the Party LO is super cute!!!! Your Creativity just blows me away. I want to take a class from you soon. Think about coming to Idaho PLEASE!!!!!!!! TFS. Btw Congrats on 2000+ followers I am one too. Congratulations on your 2000 followers, Monique! Love your work. The layout is fabulous! What fun! Glad i found you. Very nice layout. Just so filled with all the details. I'll look foward to seeing your kits the rest of the week...Happy scrappin! i love THE giveaway.. Since last christmas i'm à cricut owner.. And addicted now so i can use some more cartridges!!! Your layouts are totally amazing! I love them. Wow, what beautiful detailed layouts!!!! Just introduced to your work from the Obsessed W/Scrapbooking site but now I'll also sign up for your wonderful inspiration!! Layout is beautiful. What a great week it will be. Wow, what a great job! It's beautiful. Way to make a first impression, I just found your site last night. Your ideas are so cute! I love them. I can figure out how to order your kits. Love your work Monique, always so detailed with lots to look at! Just found your blog and I must say your projects are wonderful!! Such talent ! Can't wait to see more of your creativity. Love this...the little hedgehog is just too adorable. I absolutely love your layouts! So creative! So much detail! I love the layout and especially you sharing the directions. I live about 50 miles from a store that sells scrapbooking supplies so I don't get to go often (and it will be less with gas prices!) You've encouraged me to look through my stash for possibilities. Thank you so much! The detail in your layout is amazing! 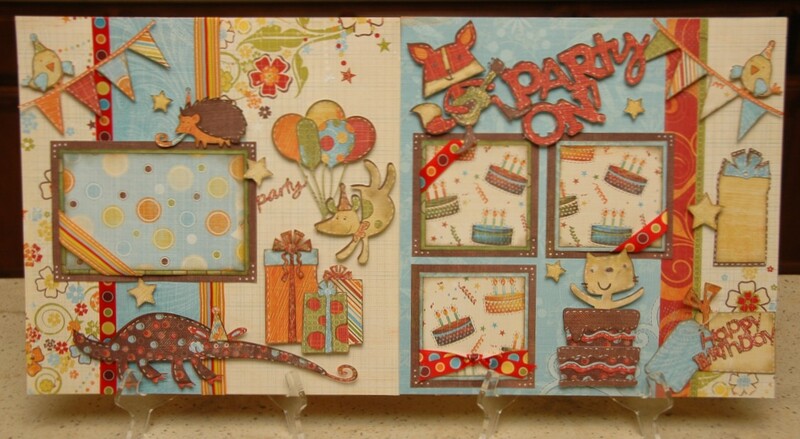 Your choice of paper piecing design is so gorgeous! As always, as cute as can be. You and your design team do such a fabulous and fun job. As always, as cute as can be. I love what you and your design group come up with. So much fun. What a cute kit. So excited to see all of the new kits you come out with this week - they are always so creative and an inspiration. Thanks so much for the chance to win the birthday bash cartridge. So glad you agreed to host everyday cricut this week. Otherwise, I never would have found you. You have great ideas and I am anxious to try your kits. I love the LO. Everything about it. Thanks for the inspiration. Just signed up and am ready for some inspiration, your stuff is amazing!! Thanks. Fabulous LO's!! I really love the road on the going places one! WOW! I am new to your blog and you have brought cricut to a whole new level...LOVE IT!!!! What beautiful layouts! Going Places is the story of my life. We are always on the go. I can't wait to get started! What fun layouts! I love them. I also signed up to follow your blog. I don't want to miss anything. I am looking forward to all of the fun this week! Thanks! I am so glad that you are blogging at Everyday Cricut. I allowed me to find you guys and start following your blog. Those layouts are really cute! A whole week of Monique and the girls. I just love it. Cant wait to see what the week brings. What a wonderful way to the start the week! Thanks for the opportunity to win and thanks for such amazing layouts! I really admire your work and hope to be just half as good as you are one day! I LOVE this layout!! I'm hoping I win the cartridge so that I can buy the kit and make the layout myself!! Love the "On the Go". And the "Party On" is perfect for my sons 1st b-day pics!! Monique, you inspire me beyond words. I'm amazed at what you do. Beautiful layouts! Love it, love it, love it! Another inspiration for me! Came to your blog from Everday Cricut, so happy you're guesting this week. Your work is amazing! Such detail, I can't even wrap my brain around how you pull the paper patterns, cuts and extras together to look so fabulous! Your kits are a great idea. Great website, great ideas! Love both the Going Places and Party on LOs! So much fun! Wow! You are an artist I love how you accent with the white gel pen. Love your kits, great to see you on everyday cricut. This layout is so cute. Birthday Bash looks like a great cartridge to have. Thanks for the give a ways. Absolutely gorgeous. I can't wait to follow your blog. Birthday Bash since I have 4 Grandkids that I could especially use it for plus the adult B-Days too. Thanks for giving me inspiration to make great pages. WOW! Your layout is amazing. Puts my Cricut abilities to shame, but inspires me to play more to get better. =) Thanks for the chance to win the cart. Love the Going Places LO, and the NEW kit is DEVINE!! Great work, Nana Susan! Love the layout! 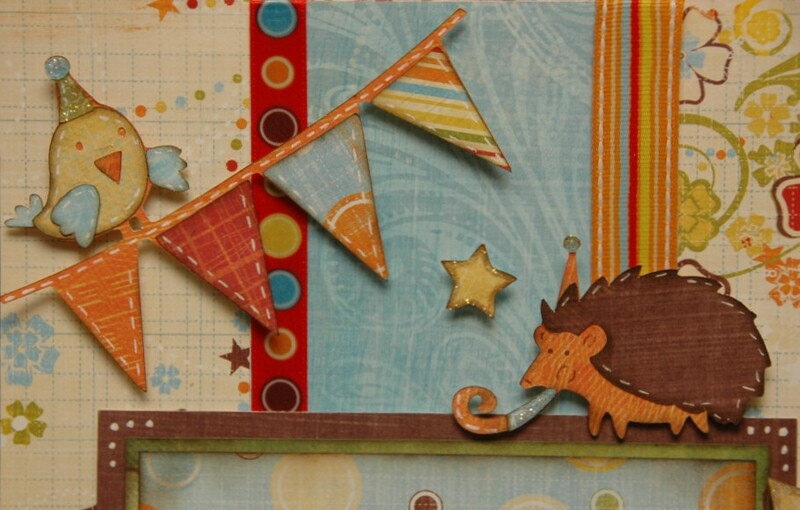 new to your site, it is refreshing to find page layouts, so many are geared to cards! Happy to be a new follower. Your layouts are so adorable and detailed. Love your projects- and that you give exact sizes for all the cuts. So happy to see you as a guest designer on Everyday Cricut. you ladies are just great. just beautiful job. Love what you do. thanks. Both the layouts you posted are beautiful and very elaborate. I love these LOs. I have to say the going places in one of my favorites so far. I love how you did the road at the bottome. Super cute!! I love your layouts. And, the Birthday Bash cartridge is on my wish list, so that would definitely be nice to win. I love the new kit. Birthday Bash has very cute cuts. Looking forward to your designs on Everyday Cricut. Such a beautiful layout. Thanks for all the great tips. Would love the have the Birthday Bash Cartridge. I love, love, love your layouts! So excited we get to see one everyday this week!! yay!! I love this layout! Love the colors! Beautiful! Love your stuff!!! You are always inspiring to me! Keep up the great work! Great job! Keep it up! And thank you for the giveaways! Great Layouts! Love your artwork! Thanks for the chance to win! Thanks for the great inspirations! And birthday bashes -- why everyone has a birthday! Looks like a winner. Love the 2 new layout you did. Can't wait to see all the new layout you have done for the week. I am inspired by you and your beautiful kits and pages. What a fun layout! Thanks so much for sharing with us! You are awesome!!! What an exciting week... I'm gonna' stalk your house and see how busy you really are... Ha ha ha!!! OMG!!! I never knew about your kits. Where have you been all my life? I just got a Cricut over the holidays and I am obsessed with it. I LOVE the layering cartridges!!! I can't wait to order your kits. Life will be so much easier. Love the birthday bash layout! What a gorgeous layout. They keep getting better and better.Congrats for reaching the 2000 follower mark!! Looking forward to everyday this week. I love how you made your own layers with the bike. Toooo clever! I'm looking forward to seeing more of your work! Love your layouts! Never realized how cute the gal on the scooter was - now I have to make her!! 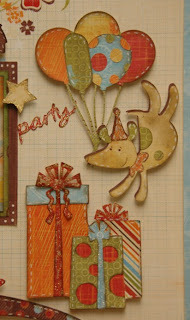 And those little party animals...adorable! Thanks for the great inspiration! Great Job! Thanks for the chance to win. Your layout is amazing! I am a new follower from Everyday Cricut :) Looking forward to seeing more creations! What a beautiful layout. Have fun on the Everyday Cricut Blog. Congrats on 2000 followers....add one more because I just became a follower. Thanks for the chance to win. I've followed your work for quite awhile so now it's offical and I'm a follower. I absolutly love your work. It's so detailed and simply stinkin cute. Oh, wow, what a great layout using this cart. Sure would like to win. Beautiful layout and great kit! Beautiful and I happen to have all of those carts but would love to win the birthday bash. I found you through Everyday cricut and so happy I did. I also live not to far I'm just a bit north in Marysville, CA. I love your blog and your artwork. Thanks for the chance to win!! Awesome layout! 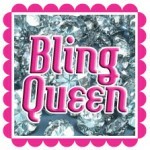 I am a new follower to your blog. Thanks for the chance to win a great prize. wonderful layouts always so much detail and very cute. Wow your layout is so detailed. You are amazing. Yes I would love to win Birthday Bash. Thank you for your talents and giveaways. Wow - this is great! I'm so glad I found your blog! OMG...Birthday Bash. I've been wanting this one for a while and your layout makes me want it even more. I'm glad you are filling in over at Everyday Cricut...love both blogs and this week the two are combined...woohoo! Monique and Wendy CONGRATS!! I dont know how you guys keep the awesome kits just rolling out! Thanks for sharing your talents! Follower here! Your layouts are to die for! I am now a follower of this blog & would love to win! I've followed you on your Pink Journey all along! God bless you! You and your team's work is fabulous! Looking forward to seeing more good stuff!! TFS! Wow - this is beautiful! As if there would be a doubt!! Very nice!! Thanks for the opportunity to win this cartridge!! I'm a newbie and just discovered your site. Love your designs and always love a chance to win a new cartridge. Thanks. I really love how you add additional touches to accent your cuts with inking and other fine details. Absolutely beautiful! i love the layout today....i have 2 of the 3 carts so will look for the other one. this will be a great week and can't wait to see what all you gals come up with! Beautiful layouts...so much detail! I LOVE that you used Everyday Paper Dolls, an older cartridge, for many of the cuts on 'going places'...it's a fave of mine...packed with goodies! Thanks for sharing..and for a chance to win Birthday Bash..so fun! Wonderful LOs! I have been a follower for some time. Congrats on making 2000 followers! Thanks for inspiring us with your amazing talent, yet again!! I love your page kits. I'm your newest follower. Thanks for a chance to win. Wow this page is amazing!!! So glad you design this week at Everyday Cricut! Your pages are sooo beautiful. Thanks for the chance to win Birthday Bash. I want this cart soooo bad. Have had you in my favorites for a long time, but now a follower! You and your team have amazing talent! Awesome layouts! And thanks for "taking over" for Joy & Melanie while they're cruising, so you can share your creativity with us. Looking forward to seeing what you have planned all week. Ok, your birthday bash layout totally makes me want this cartridge. I'd love to win it! 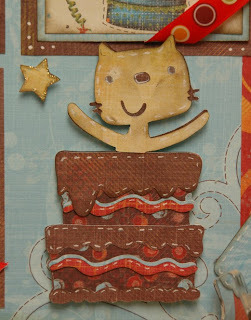 I love the little cat coming out of the b-day cake. Would love to win the Birthday Bash cart for all my grandkids birthdays! Your layouts truly inspire me! Two great LO's. Who could ask for anything more? Love it....very creative and talented, wish I could find inspiration like you guys ! Love the layout. You are always so creative. I love the layout, it is adorable. Thanks for the chance to win. Hello! I came over from Everyday Cricut! I'm a new follower and can't wait to check it all out! 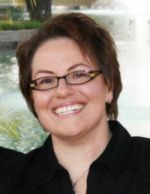 I've been to your blog before so don't know why I never followed until now! Looks like I picked a great week to start though! ABSOLUTELY gorgeous! I wish I could coordinate paper the way you can! Love it! I absolutely love your Going Places layout and I would really, really like to win the Birthday Bash cart. I look forward each day to seeing your blog. The cuts from this cart are so cute. I'd love to win it. Thanks for the offer. Good luck everyone!